how to do a professional grade gorgeous makeup. We'll do half of your face; you'll do the other half. and hand painted face chart. new color and tricks for the new you. Aura lessons always include a face chart hand painted by your Aura Professional makeup artist. 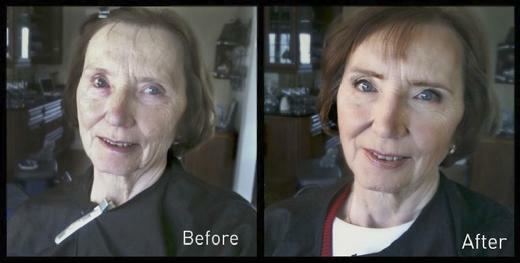 60 minute makeup application with brow shaping. Great pre-party pampering. 60 minute makeup application of the season's "must have's." Brow shaping included. 30 minute makeup application of the hot fashion colors. 30 minute beauty pick-me-up. We tidy the brows and polish your look. 30 minute eye makeup and brow shaping which will give you gorgeous eyes. Eyelash application from delicate to dramatic. we paint and apply them. coloring in and gel fixing. Your regular 30 minute brow "tune- up." Good to do once a month. to maintain your brows between services.